Armstrong World (AWI - Get Report) , Lennox International (LII - Get Report) , Masco (MAS - Get Report) , Owens Corning (OC - Get Report) and Vulcan Materials (VMC - Get Report) provide products and materials to each segment of the housing market, including new home construction, home resales and home improvement. These companies are not only benefiting from that, but they can expect to get a major boost from the incoming Trump administration's plans to spend billions of dollars on infrastructure projects across the country. Armstrong World provides ceilings and cabinets. Lennox provides air conditioning and heating systems. Masco provides home improvement and building products. Owens Corning makes insulation, roofing and siding products. Vulcan Materials makes the ingredients for concrete and cement. A stable housing market plus fresh demand from U.S. infrastructure spending should help these companies in 2017. 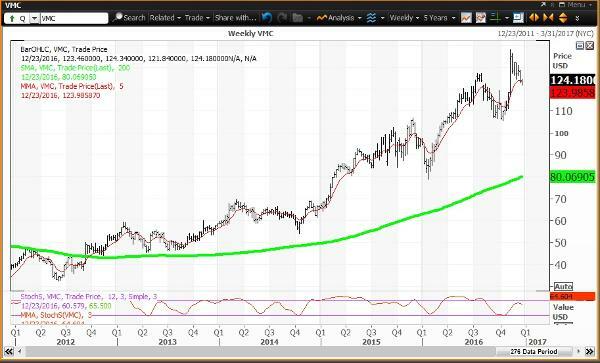 Here's the scorecard for the housing index and five construction materials stocks. The weekly chart is positive with the stock above its key weekly moving average of $42.05 and below its 200-week simple moving average of $44.58. This "reversion to the mean" has provided opportunities to book profits over the past two weeks. 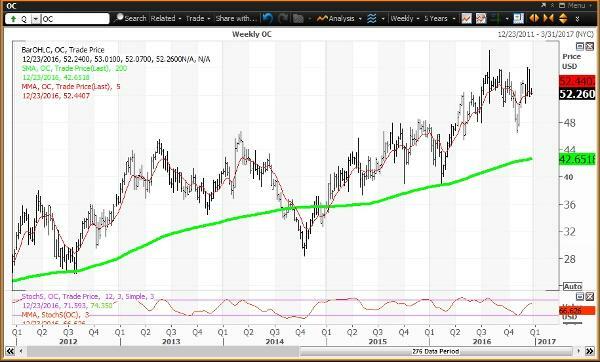 The weekly momentum reading is projected to rise to 73.01 this week up from 67.83 on Dec. 16. Investors looking to buy Armstrong should buy weakness to $41.95, which is a key level on technical charts until the end of 2016. Investors looking to reduce holdings should sell strength to $50.14, which is a key level on technical charts until the end of 2016. The weekly chart is positive with the stock above its key weekly moving average of $154.00 and well above its 200-week simple moving average of $104.98. This "reversion to the mean" was last tested as a buying opportunity during the week of April 20, 2012 when the average was $39.05. The weekly momentum reading is projected to rise to 55.56 this week up from 48.53 on Dec. 16. Investors looking to buy Lennox should consider buying weakness to $152.97, which is a key level on technical charts for this week only. Investors looking to reduce holdings sold strength to $161.04, which is a key level on technical charts until the end of December. The weekly chart is positive with the stock above its key weekly moving average of $32.13 and well above its 200-week simple moving average of $23.82. This "reversion to the mean" was last tested as a buying opportunity during the week of Aug. 3, 2012 when the average was $10.31. The weekly momentum reading is projected to rise to 41.71 this week up from 36.79 on Dec. 16. Investors looking to buy Masco should consider buying weakness to $29.97, which is a key level on technical charts until the end of this week. Investors looking to reduce holdings should sell strength to $35.32 and $36.94, which are key levels on technical charts until the end of 2016. 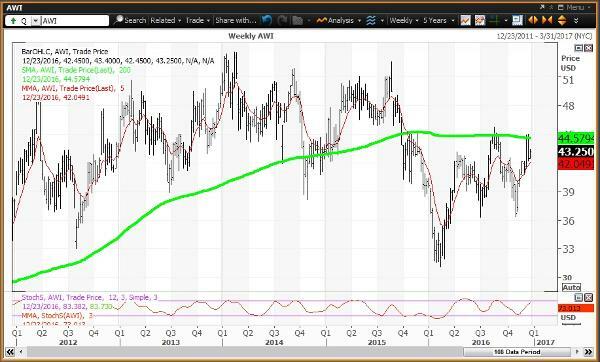 The weekly chart is neutral with the stock below its key weekly moving average of $32.44 and above its 200-week simple moving average of $42.65. This "reversion to the mean" was last tested as a buying opportunity during the week of Jan. 9. 2015 when the average was $35.57. 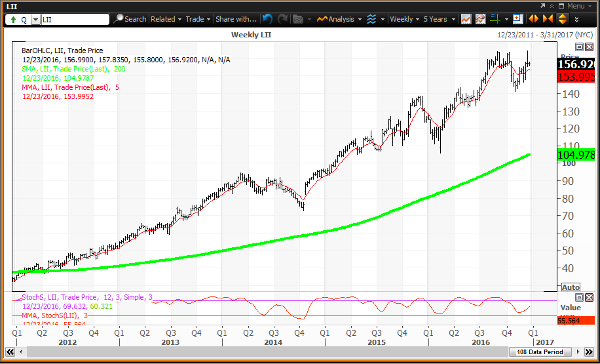 The weekly momentum reading is projected to rise to 66.63 this week up from 64.14 on Dec. 16. Investors looking to buy Owens Corning should buy weakness to $48.76, which is a key level on technical charts until the end of 2016. Investors looking to reduce holdings should sell strength to $53.58 and $55.26, which are key levels on technical charts until the end of 2016. 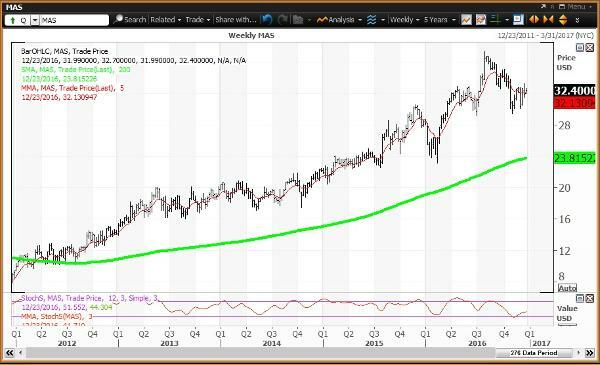 The weekly chart is neutral with the stock above its key weekly moving average of $123.99 and well above its 200-week simple moving average of $80.07. This "reversion to the mean" was last tested as a buying opportunity during the week of Sept. 14, 2012 when the average was $43.60. The weekly momentum reading is projected to slip to 64.60 this week down from 66.62 on Dec. 16. Investors looking to buy Vulcan Materials should buy weakness to $116.42, which is a key level on technical charts until the end of 2016. Investors looking to reduce holdings should sell strength to $130.17 and $133.44, which are key level on technical charts until the end of 2016.